Jerry and Mike from UK Dragonflies forum kindly suggested this location. A photographer can literally choose his composition. Continuing past the hide and barely 5 minutes into the walk and we were surrounded by Hairy Dragonflies; first a female perched in the reeds, then a mating pair in the center depression followed by yet more mating pairs and perched males. On our first visit we didn't even have the time or the inclination to continue any further along the path, but on a return visit Sue & I continued what we started - and were glad that we did so. 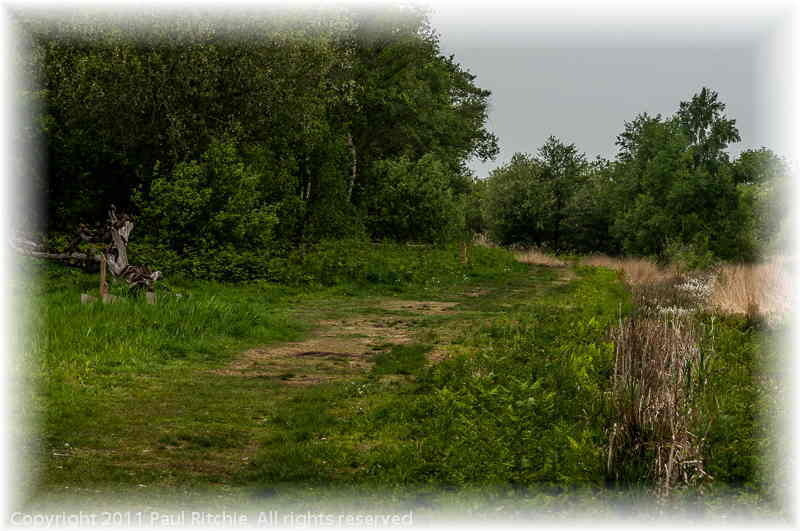 Further along, past the carved tree on the right and a nother boggy channel you will reach a large pond on the right. This pond was a hive of activity and among the reeds were the largest popolation of Four-spotted Chasers we had ever witnessed in one place. Continuing on there were yet more dragons and damsels along the margins. And we were only at the start of the season. We spent 4 hours along this one track, only returning to the car after all activity on the pond had ceased with the weakening sun and cooler air. Yet even this wasn't the end of activity. With the swarms of midges now on the wing came swarms of Hairys taking advantage of a late afternoon snack before taking roost either in the trees or low down in the vegetation A truly remarkable place,.